I get the feeling there are more to come. Mindless-Focus wrote: I get the feeling there are more to come. Also for the curious, I got mine too! The 2016 version is molded in green (not white like 2014 and 2013 figures) plastic, and the accessories are clear colorless plastic painted metallic gold. This can lead to scrapin' if the fists are too tight, and the right fist on mine is indeed too tight. Other than that I'd say he's as good or better than the 2014 version, as he pops a lot more. He really, quite literally, shines next to the other one. i am using the glow staff and club cuz the gold ones dont fit in the hands and i dont want to scratch them (thanks Adam for that heads up). Rex really is a top notch figure. i love the weight to it. the paint job is perfect and the green Gary chose looks great against the metalic teal blue pvc. i feel a lot less bad about not having the 1st one with 2.0 being as nice as it is. as for the glow parts i got, the shield doesnt have the wrist clip part (it was just the shield plate, the staff and the club, not that i'm compaining or anything). i really do feel kinda bad that no-one else seemed to get any and i'm not sure why i did (again, not complaining). Gamma X goes on sale this weekend at the trek con in NY. i REALLY hope there is some left over for online sales. Criminy I'm jealous. But my Rex is good enough for me. I got Colossus Rex also. I agree the figure looks amazing. 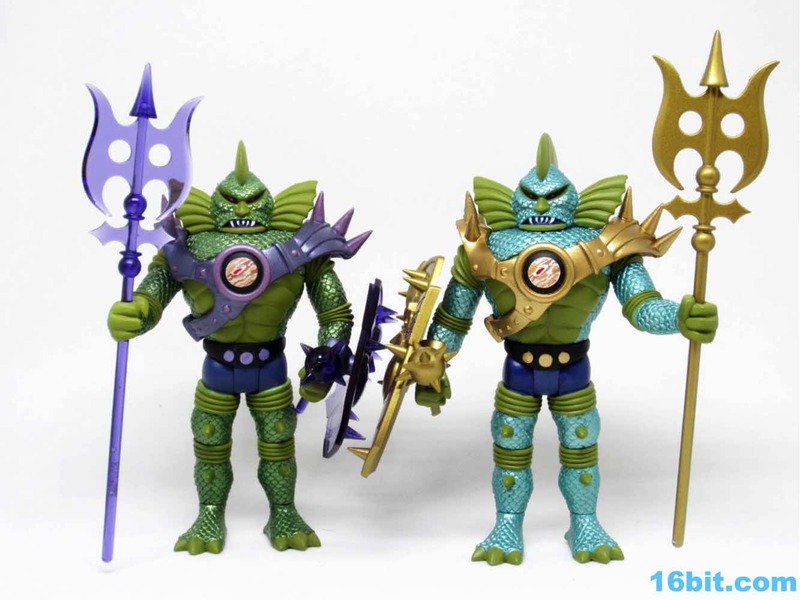 I've got my fingers crossed that I have a chance to get the Star Trek Con exclusive Gamma-X. Like Rex, that thing looks so much better than the first Infinity Edition as well. I read the original had glowing paint and the photos I've seen the glow effects aren't too impressive. The new one is cast in GitD plastic and it looks sooooo nice. I got my Rex today. No bonus stuff, but he is simply glorious. This is one of the molds I've never actually messed with before. The scales are great but those weapons! I am hoping we get a 2.0 of all the characters. I got my order of Rex and the OSM graphic novel yesterday. This is also my first experience with the Colossus Rex mold, and it's really cool! 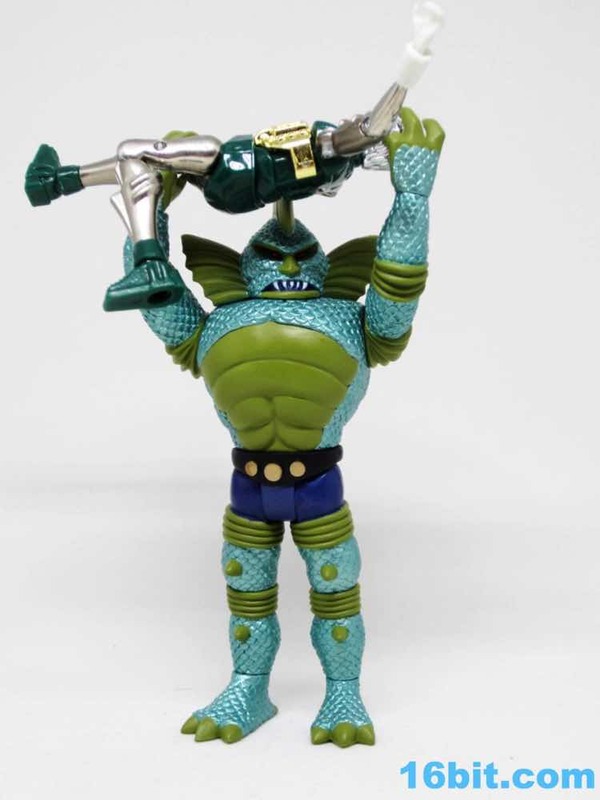 It looks great as a partner for Cyclops, since they're both larger figures with metallic skin colors and gold armor. On the left is the 2014 Infinity Edition Gamma-X. On the right is this weekend's 2016 Star Trek Mission New York exclusive one. Yowza. Am also shooting the glowing version of the armor (and shields, and axes, and etc.) and man alive is it all great. Run don't walk to whatever big box store near you sells light bulbs and spring a couple of bucks for a black light bulb if you haven't already done so. Colossus Rex and Colossus Rex! You'd be seeing double, minus the fact the one on the right is the new 2.0 release. Workin' on a full shoot for 16bit.com/the blogs... but also had to share this early. It's a good year for retro sci-fi toys. Is that one of the new Micromen he's holding? If so, how are they? 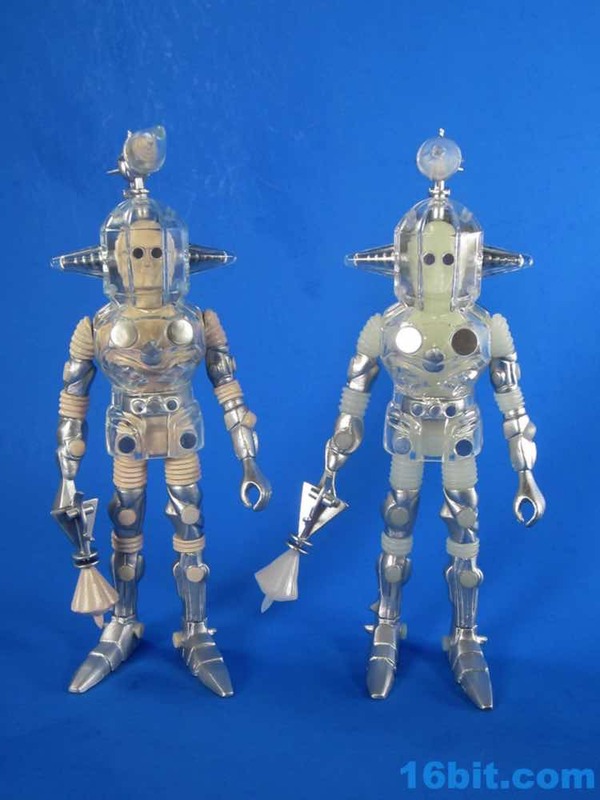 Also, I'd love to see a 2.0 Orbitron not on a white base, but colored PVC. That was the most disappointing aspect of that wave. White base made the painted bodies look sloppy. 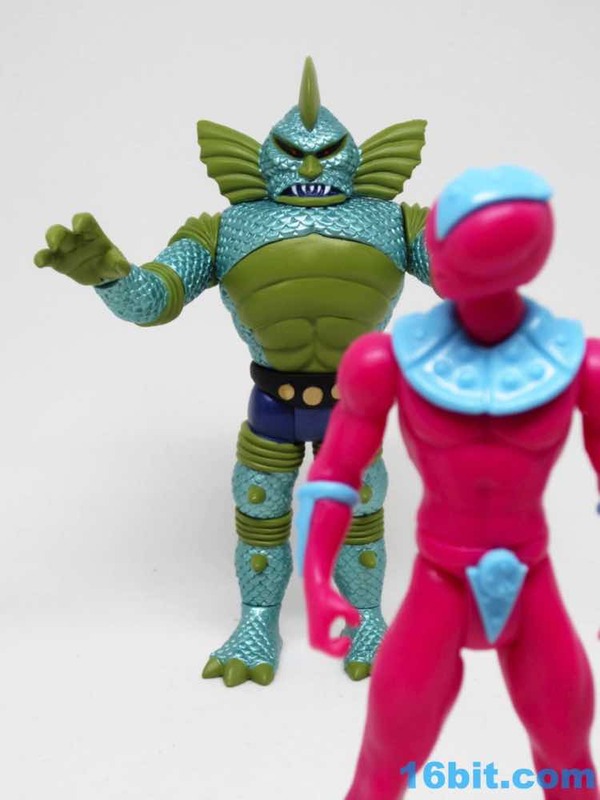 Mindless-Focus wrote: Is that one of the new Micromen he's holding? If so, how are they? It's a SDCC Hasbro one, it's pretty great! As far as I know, though, there aren't any other Micronauts in the works for the immediate future. No metal or nothin', though, it's all plastic save for some pins. Looking at the two Collossi side by side, I'm sort of liking the older one's paint job better, though I do like the 2016's one's gold weapons and armor. A case of Cosmic Raditation Gamma Xs has been set aside for online sale and will go up on the site on either Tuesday or Friday. AutoDecept wrote: A case of Cosmic Raditation Gamma Xs has been set aside for online sale and will go up on the site on either Tuesday or Friday. On Twitter Gary just told me it's Friday. I wonder how many are in a case? Also, if you're game for playing chicken, you can probably save on shipping if/when Colossus-X goes up presumably in October. You ain't wrong on the glow... but the old one does look better in normal light on a shelf. Mindless-Focus wrote: Also, I'd love to see a 2.0 Orbitron not on a white base, but colored PVC. That was the most disappointing aspect of that wave. White base made the painted bodies look sloppy. agreed, i was looking at my infinity and diversus orbitrons and the diversus one is just so much better quality. the one very noticable spot is the starburst on his belly, the infinity has tons of overspray, the onell one is spot on perfect. @ adam - that pic of the new gamma x is awesome, if i didnt know better, i'd say it was lit from the inside. looking forward to your reviews. I had a thought. Whoever owns OSM now, should release accessory sets in different colors. I would absolutely LOVE clear helmets to replace those orange things on my 4H ones. Am I allowed to flog a link to a review? TLDR: It's good, buy one. Gamma X is up now! If you're someone with a huge stash of glow figures, this dude glows brighter than my other Onell-adjacent figures. Or maybe it's just my imagination. Either way, I dig it.